Lauri Väisänen and Olli Sarantola (front) surrounded by friendlies. 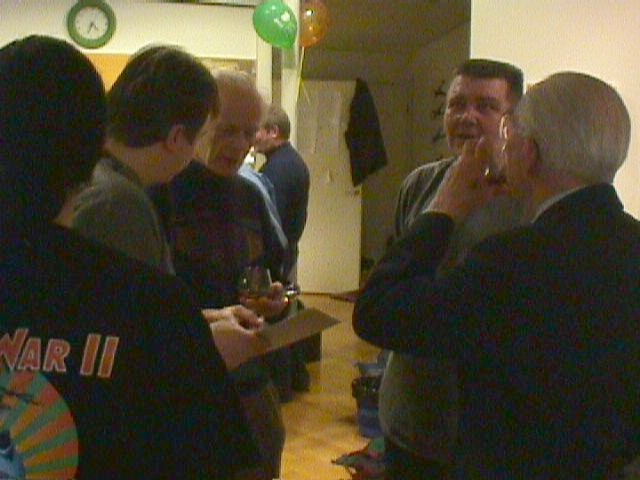 Korva and Grendel (back) showing the "ace photo" with Joel Salonen, Robert Shaw, Ilmari Juutilainen and Lauri Pekuri. Kauko Aho, Bomber Squadron 42 (PLeLv 42). Bomber pilot. Piloted operationally Blenheim bombers during 1944. 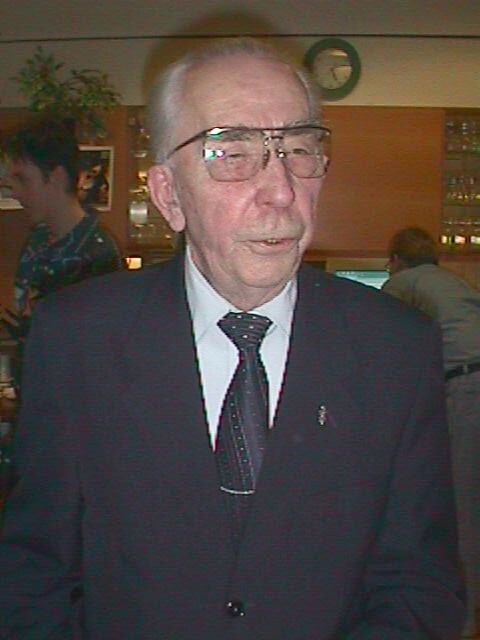 Olli Sarantola, Fighter Squadron 26 & 30 (HLeLv 26, HLeLv 30). Fighter pilot. Piloted operationally Fiat G.50s, Brewsters and Messerchmitt 109 G-6s. Lauri Väisänen, chairman of "Tampereen Ilmasilta" aviation organization. Fighter pilot. Piloted: Smoliks, Viimas, Focke Wulf Stiegliz, Tuisku, Pyry, Fokker D.XXI and during the war operationally Fiat G.50. The visit was very enjoyable, seemingly for both parties. 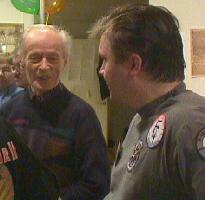 The veterans seemed positively surprised how enthusiast the younger "virtual pilots" were about aviation and their visit. We hung on them asking dozens if not hundreds questions. 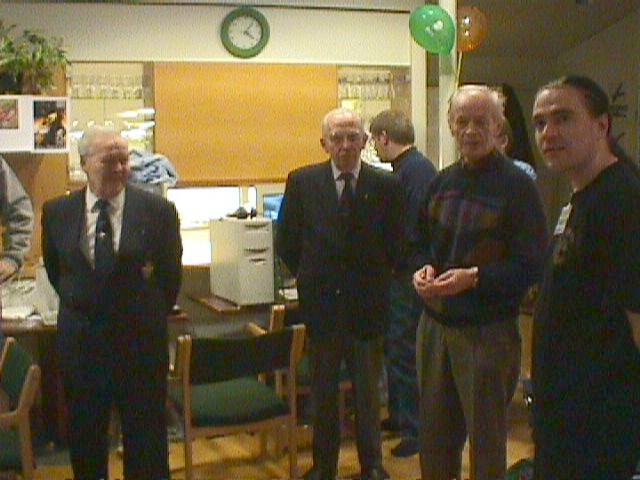 The gentlemen were also shown several air combat simulators, told about the virtual pilot's hobby, offered as much drinks as they could consume and it seems they enjoyed visiting us. Thank you Kauko Aho, Olli Sarantola and Lauri Väisänen. Written by Ville "Camo" Pitkänen LLv34 Kapt Camouflage. Lauri Väisänen, chairman of 'Tampereen Ilmasilta' aviation organization. Fiat G.50 pilot. Olli Sarantola, Fiat G.50 / Brewster / Me 109 G-6 pilot, HLeLv 26 & 30. 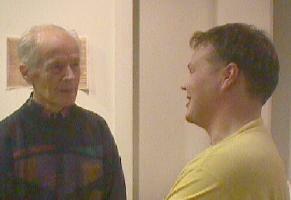 Kauko Aho, Blenheim pilot, PLeLv 42 talking with Korva. 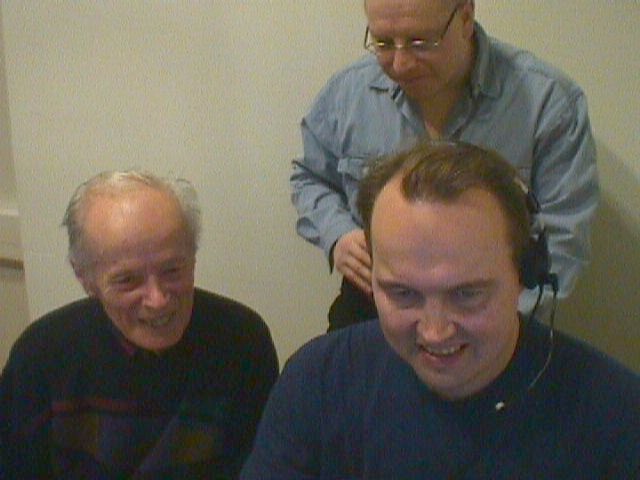 I had the pleasure and honor to talk to Kauko Aho, Olli Sarantola and Lauri Väisänen at the Urban Blitz online simulator convention at Tampere, Finland, on saturday 4th February 2001. Sarantola flew Fiat G-50's (FA), Brewster 239 Buffaloes (BW) and Messerchmitt 109 G-6's (MT) during Continuation War between Finland and Russia in 1941-1944. He served in Fighter Squadrons 26 and 30. Aho flew Blenheim bombers during the Continuation War, serving in Bomber Squadron 42. Lauri Väisänen flew the Fiat G.50 fighters. It was very interesting to hear their stories and ask questions about the war days. 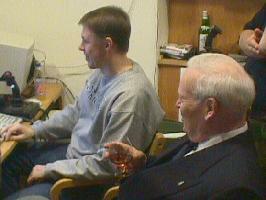 All were in good shape and very interested in our hobby, flying WW2 air combat simulators online on the internet. The Finnish Air Force World War Two veterans arrived at the convention at 4pm. They were warmly welcomed and introduced to us. Cognac and other drinks were also served. The gentlemen told briefly about their duties during the war. 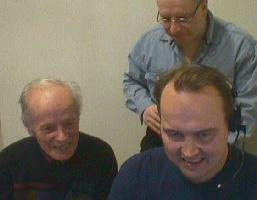 After the formalities, the veterans started to mingle with us virtual aviators. They turned out to be very nice and friendly people, not that I had presumed otherwise. 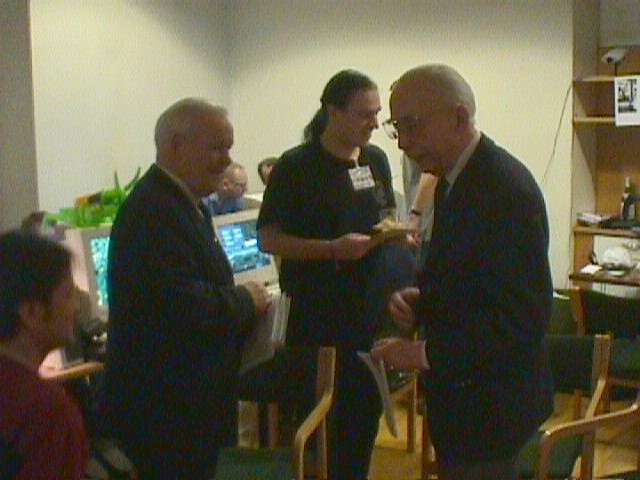 The visitors in one picture, left to right: Lauri Väisänen, Olli Sarantola, Kauko Aho (and Grendel). Pentti "Buffalo" Kurkinen, the maker of Brewster and 109 G-6 for CFS/CFS2, was discussing with Olli Sarantola about these 2 planes and his experiences of them in combat. It was fascinating to hear first hand experiences from a true WW2 combat pilot! The Brewsters he flew were unfortunately quite battle-worn and not in too good shape anymore. When they received the 109 G-6's in 1944, their squadron's combat effectiveness increased significantly. Sarantola told that the MT was easy to fly and overall a safe plane. Only on takeoff, if you raised the tailwheel before you had enough speed to control the yaw with the rudder, you would be in serious trouble. The torque of the prop would take over and the plane would veer to the side. Without enough speed to control it with the rudder, this usually lead to a broken plane. Blenheim pilot, Bomber Squadron 42, Kauko Aho arriving to Urban Blitz 2001. Therefore it was important to keep the tailwheel down until you had enough speed for rudder control. Flying and landing was easy. Like it is well known, many young pilots wrecked MT's on takeoff, usually because they lifted the tailwheel too soon. Sarantola was one of the few pilots that were sent to Germany for night fighter training. They received part of the training with two-seat 109 G-12's. Sarantola wondered why Finland didn't try to get a few of these for training purposes. A start or two in a two-seater for each starting MT pilot would probably have been enough to prevent all the "start kaputs" that happened. But the Finnish Air Force officials probably were not even aware of the 109 G-12 and getting them into Finland would probably have been quite unlikely, Sarantola thought. Talking of landing qualities, the FA was quite hard to land in his view. If you didn't get it exactly on three points, it started bounce, which was hard to stop. Sarantola characterized BW as a real joy to fly, but in the late stages of the war badly outclassed. In his words, the MT was the best figher of that time. 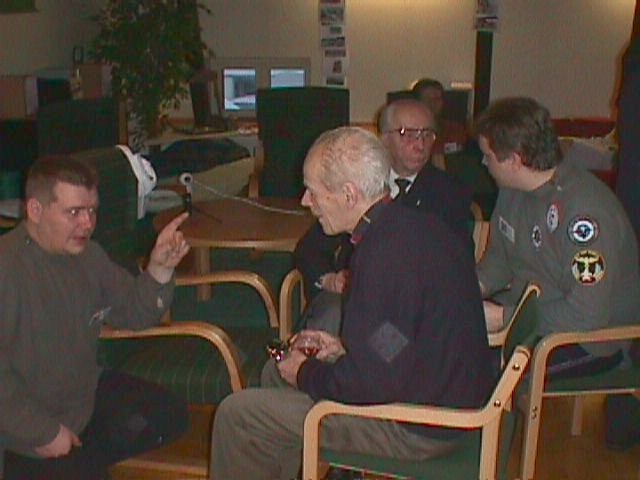 "Pendulum tactics", the finnish term for boom'n'zoom energy fighting, proved to be deadly effective with MT. It was a better plane than what most of their russian opponents had, except maybe the La-5. That plane had an infamous reputation above the finnish frontlines. Even though the late Yaks had better performance than the La-5, the pilots of those planes were not usually up to the La-5 pilots' skills. I believe that the La-5's were flown by the better trained "Guards Air Regiments" while the Yak squadrons' pilots were less skilled. This might explain what the finnish fighter pilots experienced in the air. During the discussion Kurkinen showed his newest version of the 109 G-6 for CFS2 and discussed the various features of the plane with the former G-6 pilot. Another person also joined us and asked about the flight characteristics of the plane. Sarantola recalled that the MT was a very stable plane, but not the most maneuverable. The stick forces were quite large and elevator trim was used quite frequently while maneuvering. The BW, on the other hand, was a very light and responsive plane to fly. 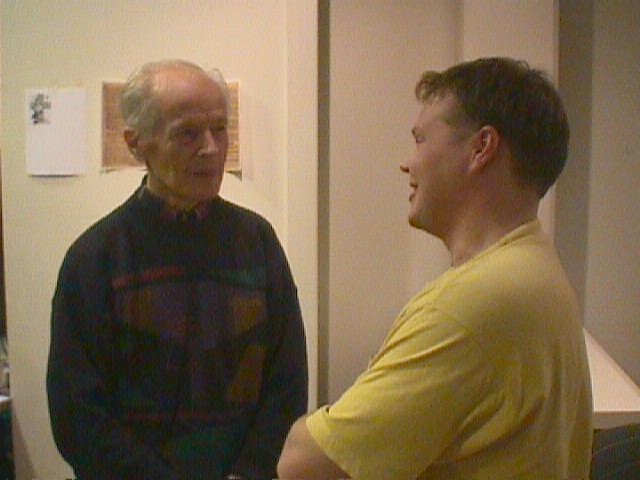 Camouflage and Olli Sarantola. 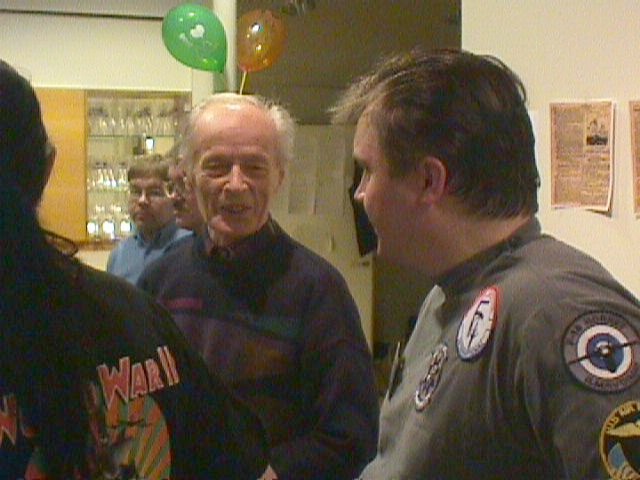 Lauri Väisänen, Grendel and Olli Sarantola. During air combat, the pilots always tried to get as close as possible. He told that the gunsight was not that important in aiming itself, but it helped immensely in estimating the required deflection for the shot. When the target filled the gunsight, it was in range. The fact that all the guns of the MT were located in the nose helped gunnery, since you didn't have to worry about convergence too much. The BW was a different story, since 2 machine guns were in the wings, therefore it was more demanding in regards to shooting distance. The MT had 3 ammunition counters in the cockpit, on the left side of the Revi gunsight: for the 20mm cannon in the middle and for both of the mg's on the sides. 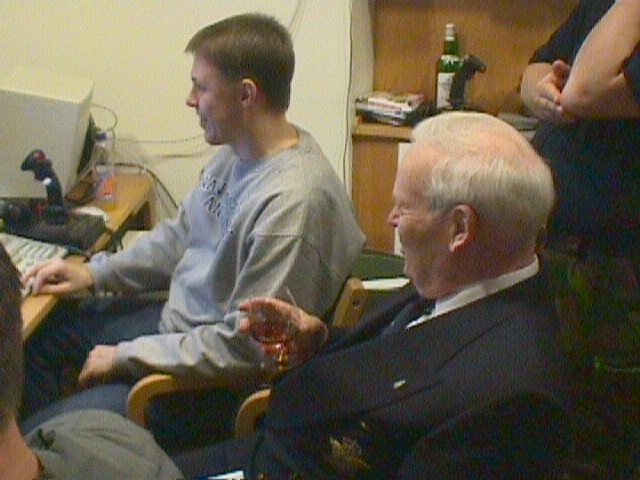 A bit later I found Kauko Aho sitting by my computer, watching as Risto "Korva" Korva showed him the Ju88 bomber in Warbirds. I joined the discussion and showed the combat veteran another model of the Ju88, in Aces High. I also showed him the Finnish terrain I'm working on in Aces High, which he found very fascinating. His only complaint was that the battle areas east of lake Laatokka, where he did most of his fighting, were not on the map. The reason for this is that the terrain focuses on the final battles of the Continuation War, which took place on the Karelian Isthmus, west of lake Laatokka. 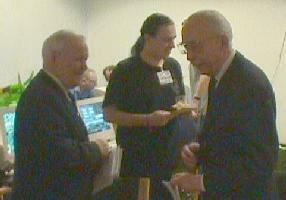 Kauko Aho chatting with Harppa. 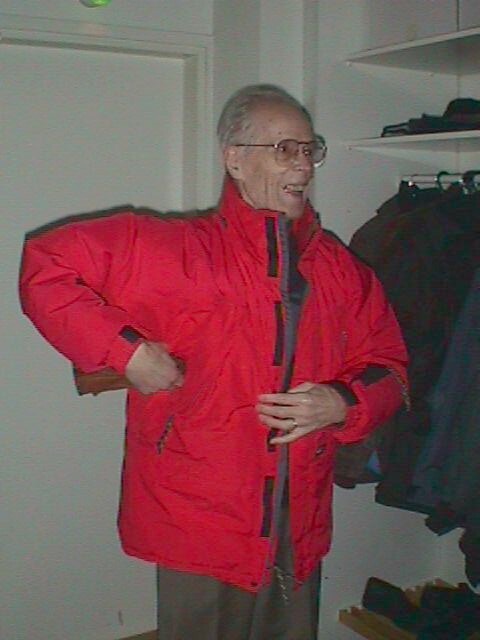 He told us about a bomber mission he had taken part in over the eastern part of the Gulf of Finland: Their target was at the Gulf of Viipuri, some russian ships that were attacking the shores. As they crossed the coastline from the north, there were large thunder clouds on both sides of them, at about 3km altitude. There was a gap between the clouds and the ships could be seen below. They were presented with a magnificent view. Lighting bolts struck from one cloud to another between the gaps. 20 and 40 mm AA-fire reached towards them from the ships - it was hard to tell what was a tracer and what was a lighting. He told me it was the most memorable sight he has ever seen. I showed Aho some parts of the finnish AH terrain and discussed about the clouds in Aces High. He then started to wonder about the weather modeling in flight sims in general. 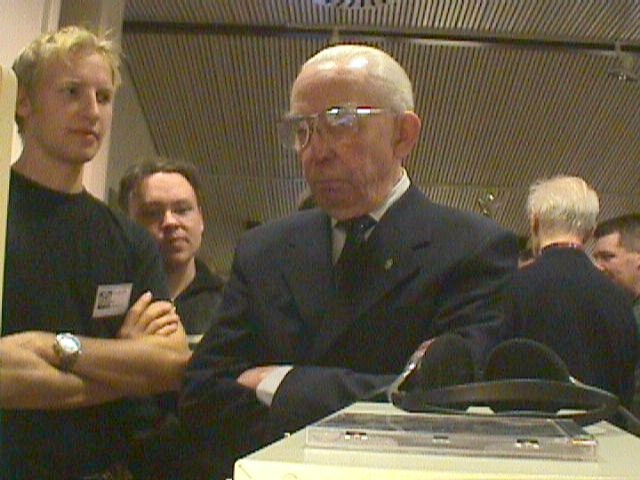 When he heard that it is almost non-existant, he reminded that it played a huge part in real life, especially during the war when you sometimes had to fly in very bad conditions. He estimated that their Blenheim squadron lost more planes due to bad weather than to enemy action. During one mission near lake Laatokka, the squadron ran into bad weather and most planes got lost. Only a few made it back to their own base, most others landed to bases all over Finland. Fiat pilot Lauri Väisänen seems amused at some WarBirds action. Kossu left. Lauri Väisänen equipped with a tasty drink listen's at Kossu's demonstration. CFS2 has one of the best weather modeling of the current flight sims, so thats what I showed him next. I launched the game with Kurkinen's 109 G-6 and showed Aho some rain and clouds in the game. He said that even the worst conditions in CFS2 were nothing near the "pea soup" they sometimes had to fly in. When the clouds were at 50 meters altitude or even lower, you had to be very careful not to hit trees or other obstacles as you tried to fit your plane between the clouds and the ground. Our discussion then turned into navigation, which is naturally a crucial point in the real world and too often a neglected reality in combat sims. In the wartime Blenheim bomber planes, the navigating officer was in charge of the ship, while the pilot, usually a young non-commisioned officer, steered the plane according to the captain's orders. This was sometimes not the best arrangement, since some of the navigators were not very experienced pilots and managed to get lost completely. The bomber pilots had a joke that the navigators can only find their way "from tree to tree", just like the ground troops do their navigating in the forests. On the other hand, if an experienced pilot finds a distinguishable landmark, such as a lake, he can easily find the way back home even in very bad weather. When you're in the air, the distances become shorter and navigating becomes easier than one might think. One reason which prevents accurate modeling of this, is the fact that land graphics are usually very simplified in sims, making landmark navigating impossible. We flew a mission with 10 Junkers 88 bombers to show the visiting real WW2 pilots what a sample mission might look in the virtual skies. 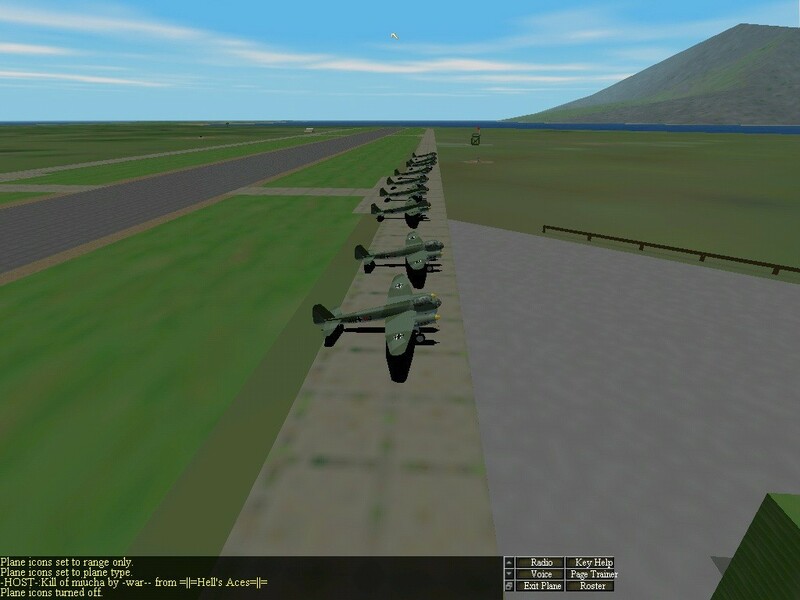 Then it was time for our scheduled bomber mission, showing the veterans how to do a 10x Ju88 mission in Warbirds. Grendel came up with the battle plan and divided the pilots into two five-plane groups. We were to fly to the target in two inverted-vee formations. As the call to roll echoed, we screamed down the runway and took off. Unfortunately, the bomb mechanic had obviously loaded my plane incorrectly, which resulted in my plane dipping its right wing, making curly salad out of my starboard prop. I ditched the plane and hurried to a new one. As we took off again we were over 2 km's behind the main group. Aho commented that that was exactly like it was in the war as well. As we reached the group, we found them - not in a nice formation - but in a line, "just like pigs of a poor house". Again, just like back in the old days, said Aho. It is easy for the formation leader to fly, he said, just slam the throttle to the firewall and enjoy the scenery! However, in a few moments we managed to form two nice vee formations and climbed towards the target. The mission went well, even though we had to change the target once. 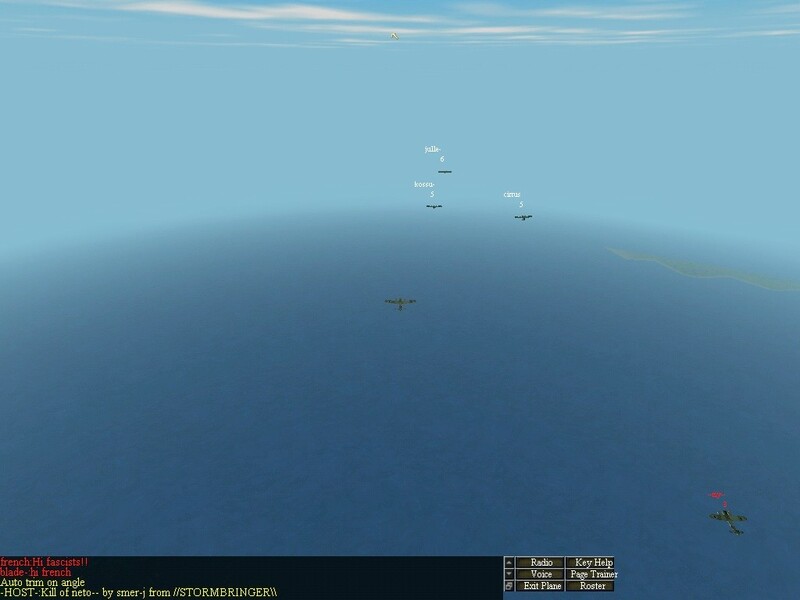 PJK and myself made the drop by dive bombing, showing Aho where the Ju88 excells. 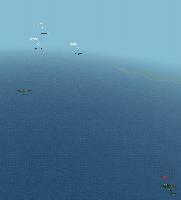 Even though one enemy fighter was seen near the enemy field, all 10 bombers landed safely and taxied to a group photo. One unfortunate pilot mananaged to collapse his right gear while taxiing, wrecking the plane. Aho didn't think the Ju88 landing gear was that weak in real life. The bomber pilot, Kauko Aho, following closely our bomber mission. Demonstration done by PJK and Eni. Aho was very enthusiastic about the flight sims and had many questions regarding the realism. He compared the games to his real life experiences. He noticed that especially the newer games with better graphics looked very realistic. 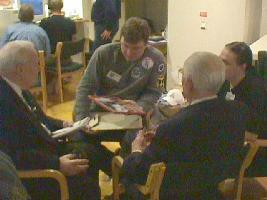 After this bombing presentation we started to discuss pilot training in the finnish air force during the war. I was very interested in hearing how aerial gunnery was arranged, since the FAF pilots had a reputation of being excellent marksmen. He told that the aerial gunnery drills were flown with practise fighters, he did them in the biplane practise fighter Gloster Gauntlet (GT) as well as Fokker D.XXI's (FR), including the rare variant with retractable landing gear. The target was a canvas bag, about half a meter in diameter and a meter or two long, dragged by a plane, usually a Fokker recon plane. The pilots were taught gunnery attacks from the side, slashing attacks from above and below, as well as from straight "six" as well. Aho developed his own technique by sliding the plane with the rudder and shooting the bag from the side. He achieved excellent marks in aerial gunnery, "full 10". Gents talking in middle of the con room Grendel, Korva, Kauko Aho, Neck and Olli Sarantola. Aho saw enemy fighters only twice (possible misunderstanding here by the listeners, either Aho saw enemy fighters twice or friendly fighters twice), but in the other case his bomber was shot down (BL-158, 01.08.1944). Mr. Aho was the only survivor. This situation will be described closer in article about mr. Aho in these pages. Many of the bomber missions they flew, were performed unescorted by finnish fighters. On a few occasions they saw finnish and german fighters nearby, which gave them a feeling of protection. Aho told that the general pilot skill level was low among the russians, compared to the Finns. He had also had the chance to fly with a captured russian DB-bomber and he had noted that the engineering of the russian plane was not up to western standards. Engines were easy to malfunction and the gauges had to be monitored very closely. This might also have played a role during the war. Aho was a personal friend of 2-time Mannerheim Cross recipient Hans "Hasse" Wind, the second ranking FAF ace with his 75 victories. Just before the war, while Wind was in flight officers' school, Aho frequently played football with him at Kauhava. Wind used to say "Ich bin der Windt und komme Schwindt" as he ran back to the barracks after the game. Wind was badly injured while on a recon flight with 109 G-6's over the Karelian isthmus during the last weeks of the war, on 28th July 1944. An Airacobra hit his cockpit with two 37mm shells, wounding his neck and left hand badly and destroying the engine management levers. Fighting against unconsciousness and the badly stricken plane, he managed to ditch at his base and was hurried into hospital. He received his 2nd MR2 later that day. When the war ended, their ways separated. Wind moved to Helsinki. 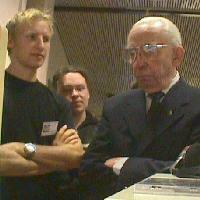 In his final years he moved back to Tampere where Aho met with him more often again, until Wind's death in 1995. Gents equipped with drinks and surrounded by Neck and Korva. Front Kauko Aho, back Olli Sarantola. Aho is the former chairman of Pilven Veikot, "Chaps of the Clouds", the association for WW2 Finnish Air Force pilots. While most of the pilots have moved on to better pastures, the remaining ones still hold the finnish pilot traditions high. 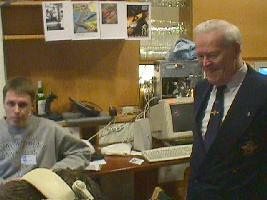 While talking to mr. Aho he also mentioned, that next year is the 60th anniversary of their pilot's course at Kauhava. Imagine that! 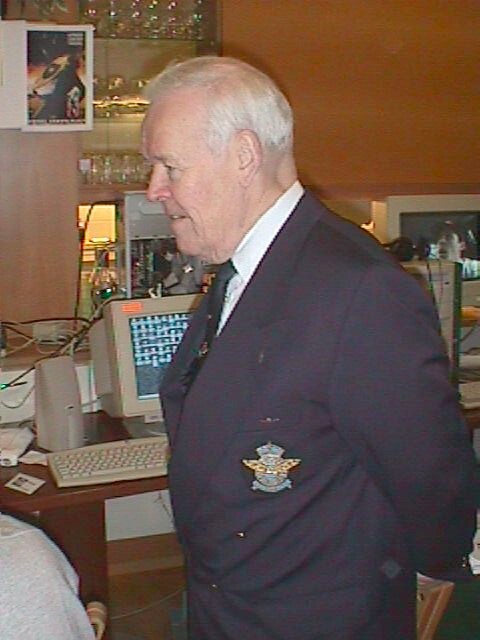 We of course talked very much with mr. Lauri Väisänen, Fiat G.50 pilot. 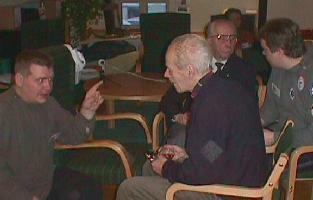 He for example mentioned how his squadron was sent north to fight in the Lappland War, against Germans. The Germans retreated though so fast that they were soon out of range and they didn't get to fly missions against them. Very luckily maybe, because the Fiats were already very worn out. Mr. Väisänen also talked about the years after the war and how hard it was to be a flier in post war Finland, during the "years of danger". Expnalation to foreigners: while the country had survived the war with intact government the communists were very much trying to wrestle for power. For example the national police was controlled by "reds", and many war veterans were interrogated harshly for fighting against Soviet Union. The Finnish aviation organization was disbanded 1945 by the communist activists, but the war pilots and civilian/hobby pilots immediately formed a new organization. This was like a stick in flesh to the reds and they tried to disband this organization as well many times. The most amusing episode was when the aviation organization acquired miniatyre "pulse-jets" for model aircraft and so on. Yes – same kind of engines that were used in V1 rockets. Now THAT caused huge noise and alarm in the communist circles: they're arming for revenge war against Soviet Union! The noise went up to the government level and the communist controlled secret police – and finally the Soviet Survellaince Committee (Soviet & western observers making sure Finland is not preparing for new wars and playing war reparations) arrived to take a look what evil plans those aviators are hatching. They saw the little pulse-jet engines, some 30 cm long, and laughed "all that noise from these? Keep on guys." And they simply left – and the Finnish communists were so disappointed. "What? We can't disband that aviation organization or put anyone in jail or anything?" I feel grateful to the gentlemen and women who fought for the independence of our country. The Virtual Flying Squadron Icebreakers, VirtuaaliLentoLaivue Icebreakers, can also be proud of their heritage in the virtual simulators. 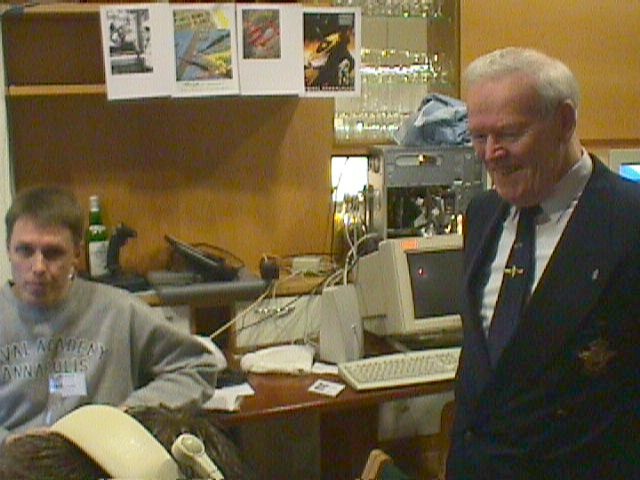 The squadron logo, originally drawn by the ex-squadron leader Lark, was shown to the veterans, in both our squadron "army shirt" and squadron t-shirt. As the squadron symbol proudly shows the Von Rosen's cross, the original Finnish Air Force and Defence Forces symbol from 1918, they were delighted to see us wearing the symbol today and expressed their appreciation for that. Also in general, the visitors told us they were positively surprised seeing us and what we did. Younger generation who try to keep up their traditions and spirit - in our own special way. As mr. Kauko Aho put it: "I couldn't at all imagine how nice things you have here", how much we try to simulate their history and remember - and how enthusiast everyone was to talk with the real veterans, ask questions and have them as guests of honor. It was a great honor to have them with us.